Last week I attended a maturation program at an elementary school with my daughter who is in 5th grade. Each time I attend these presentations (she's my 3rd daughter to go through this at school, with Mom by her side) my mind is flooded with memories of my own experiences at that age. I think I was one of the first in my grade to wear a bra, and I have distinct memories of long and hot days in 4th grade-- hot because I wore a sweater (a thick, itchy sweater that made me sweat even in winter) every day to avoid even the possibility of anyone seeing the outline of my bra through my clothing. Still today, when I'm not careful (or if I'm tired) my posture reflects how I held myself during those formative years. I cringe to think of it, and though I've worked proactively to help my girls not be ashamed of their bodies, I know that some of it simply comes with the territory, particularly during puberty. Look, I can't pull my feminist pants up high enough to ensure that All Girls Of The Future will never feel ashamed when their bodies do exactly what they're meant to do. Still, I champion any cause that makes it easier on them, physically, practically, and/or emotionally. And this is why I'm really excited to tell you about GirlLux. Girl Lux is a company started by Melissa Ovard to help girls be more comfortable and confident as they adjust to how their bodies are changing. Their mission is to offer underwear and sportswear that are high-quality, stylish, and age-appropriate. They are a woman-owned and women-run company with the goal of empowering girls with products that make them feel beautiful, inside and out. And? A huge part of what they do is work to keep girls safe: they've committed that you will never see any pictures of their products modeled on girls on their website. One of their awesome products is the Pocket Pantie. It comes in a cotton/lycra blend brief, or a girl short style. It has a small, interior pocket, sewn in just below the waistband, which is just big enough to hold a wrapped liner or pad, and discreet enough to not be noticed or bother a girl while she's sitting. When she goes to the bathroom, if she finds herself in need of any supplies, she's got what she needs without having to carry her backpack into the stall with her. Another cool product is their Debut Bra, a smarter version of a training bra. Made in soft, stretchy fabric, it doesn't have a back clasp, and is available in five skin tone-matching colors so as to be less visible under clothing. It fits AA/A/B cups and is machine washable and can go in the dryer. "It's thin, soft, and comfortable." "They're so soft and comfortable!" "It's stretchy, comfy, and I love having the pocket." "It's soft, comfortable, thick and stretchy." "It's soft. I like the fabric, and love the colors." "I like that it's so comfy and stretchy. It made it so I could move around more." If you're as excited about this product as I am, go to the Pocket Pantie Kickstarter and give what you can. I wish on All The Stars I would have had these products when I was my daughters' ages. Let's get this company going, their work is valuable and important. There's not much time left-- it ends on November 2nd, so go there now! This post was made possible by Girl Lux. 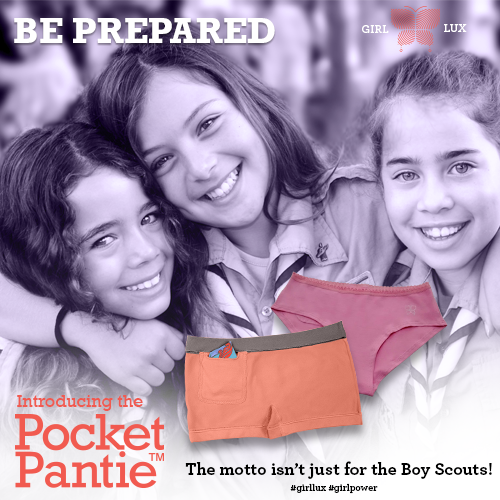 Join their Pocket Pantie Kickstarter to help girls feel confident and prepared no matter what! You can follow their progress on Instagram and Facebook and share it with your favorite teen and tween girls.